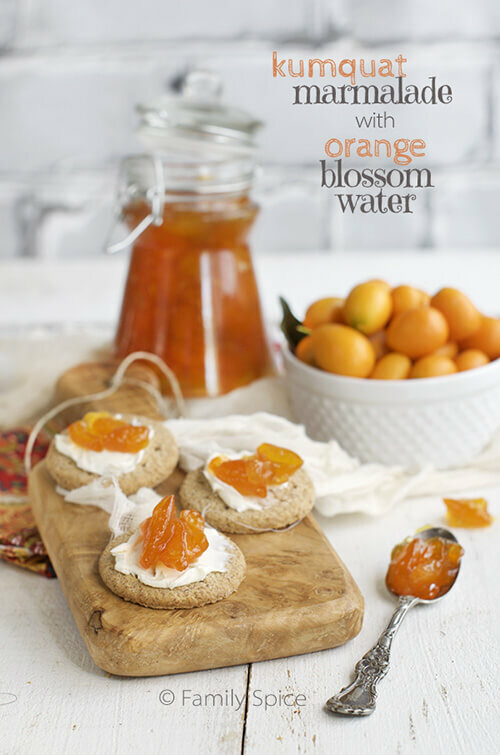 Wake up your taste buds with this refreshing and aromatic kumquat marmalade with orange blossom water. I have professed on my blog before about my love affair with jam. Nothing makes me smile more than a jar of sweet, fruity jam. No matter how many diets I go on, my ultimate breakfast food is toast with cream cheese and jam. Jam. Jam. Jam. And it’s not just for summer fruit. My daughter loves kumquats. They are in season now and are truly a wonderful snack for the kiddos. You can pop them in your mouth, easily enough. They are incredibly portable and travel well. And their bright orange color make them happy and very appealing. Don’t let the sour fruit scare you. The skin is sweet, not bitter like it’s other citrus cousins. The entire kumquat is edible. Making homemade jam is a family tradition. My grandmother, aunts and my mom all are avid jam-makers. So the art of making jam is second nature to me! For this Kumquat Marmalade, most of the tedious work is from removing the seeds. Hard to believe that these tiny orange jewels have such big seeds. Personally, I think kumquat marmalade is much more delicious than any orange marmalade. The secret is the skin. Kumquat skin is remarkably sweet. 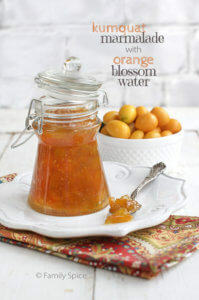 And my kumquat marmalade has the addition of orange blossom water. You can find that in middle eastern stores. It adds a subtle fragrant floral dimension to your kumquat marmalade. You can also use rose water, too. Jams are perfect with your morning toast, tarts, cookies and even a simple cheese platter. And if you can your jam, they make gorgeous gifts! What is your favorite jam? Slice halved kumquats into rings and place in a nonreactive saucepan. Once mixture starts to foam and boil, reduce heat to medium-low and continue cooking until mixture thickens, about 20-25 minutes. 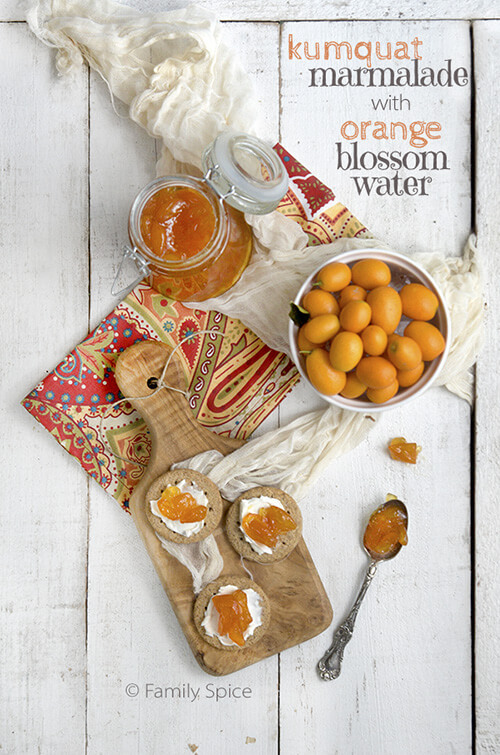 Cooking Tips: You can substitute orange blossom water with rose water.